Published on Thursday, December 29, 2016. This article appears in the December/January 2017 issue of American Craft Magazine. 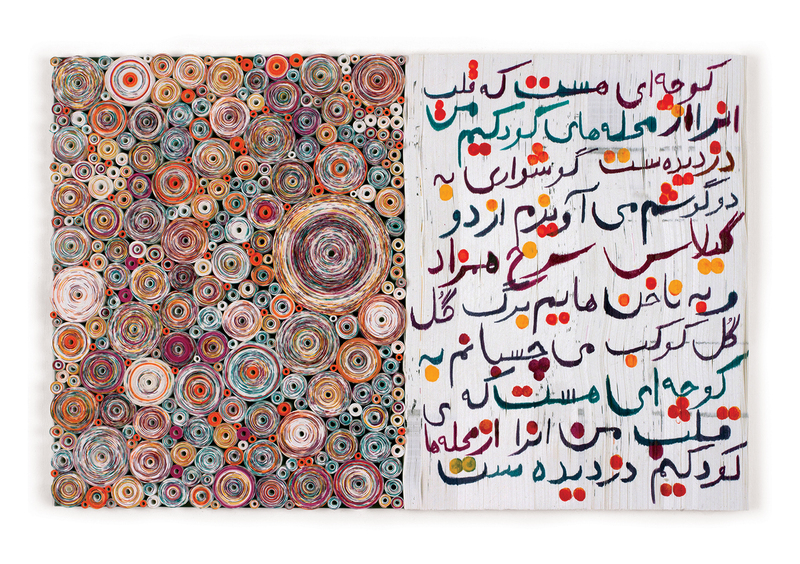 Hadieh Shafie includes the word eshgh, Farsi for “love” or “passion,” on her paper scrolls. There may be no better term for the Brooklyn artist’s exacting practice. The cost of an MFA degree has spurred jokes about starving artists and ramen noodles, but it’s often a reason art students scrimp on materials. 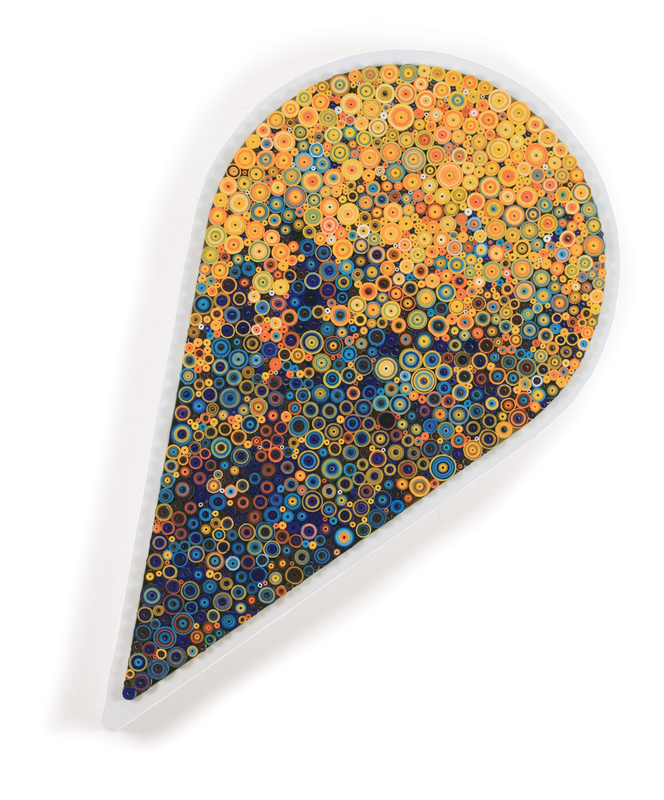 In her early years at Pratt Institute, Hadieh Shafie says she “would paint on anything” – discarded wood paneling, scrap metal, leather – to save money. One day at an art supply store, she came across a stack of wrinkled Italian Fabriano paper that was headed for the trash. Intrigued by the odd creases, she got some ink and started fooling around. That’s when she realized that, instead of trying to paint on the paper, perhaps she could make art out of the paper itself. Shafie graduated from Pratt in 1999, but it would take another 10 years for her to become a self-sufficient, full-time artist and perfect her process for making mixedmedia works. In 2015, the Iranian-born Shafie celebrated her first solo New York show – and if that weren’t enough of a marker of success, consider this: The once-starving student has hired an intern. And she needs the help, given the legwork it takes to collect her materials and the intensive handwork required to make each piece. “I’m fascinated by books – and reinterpreting what a book can be,” Shafie says. 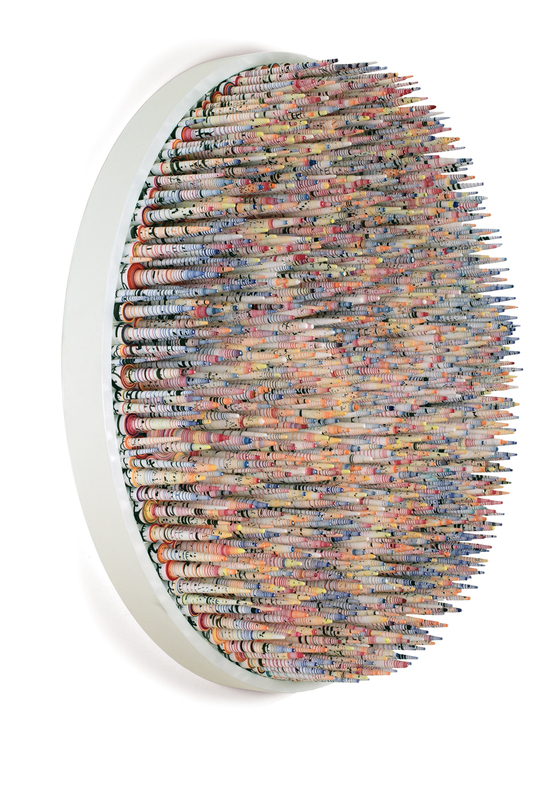 Most of her works feature text, but the lettering lies beneath layers of paint and paper. (Hidden Words is the title of a 2014 catalogue of her work published by Leila Heller Gallery.) 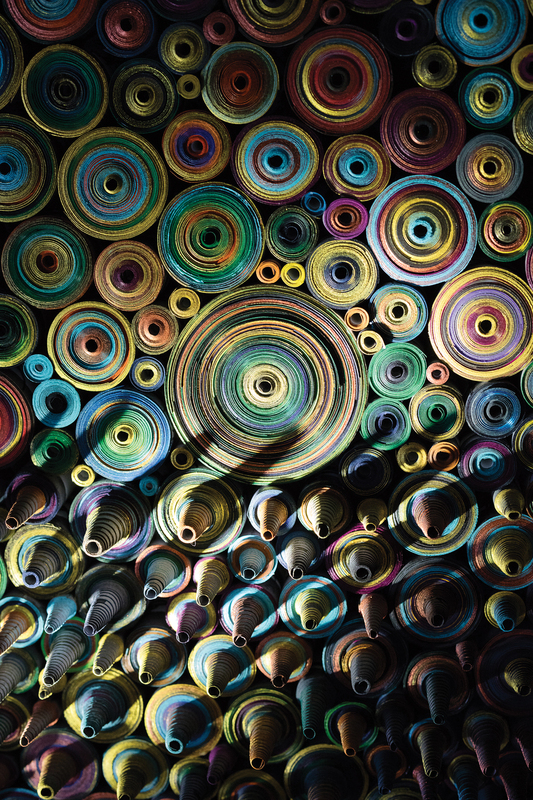 Shafie’s multi-step process borrows from quilling, but also incorporates elements of calligraphy and color-field painting. 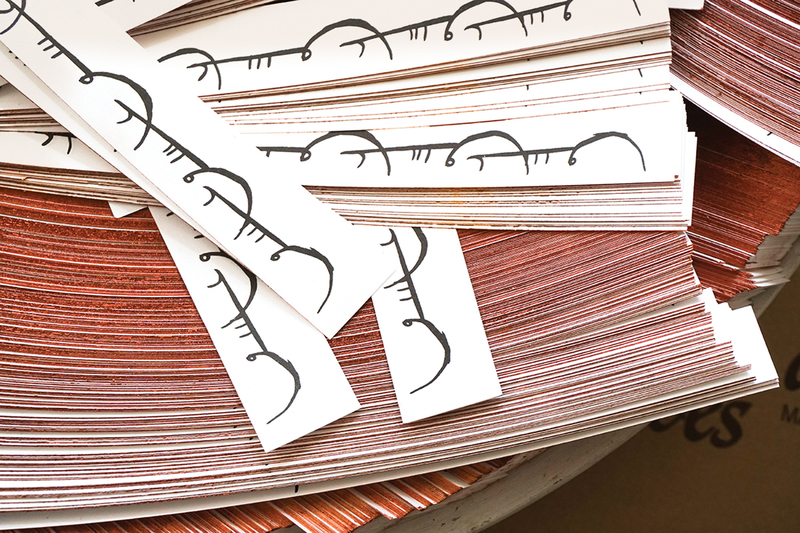 Shafie begins the labor in her Brooklyn studio, making a drawing of the Farsi word eshgh, which can be translated as “love” or “passion”; then she has the drawing printed onto paper, which is cut into 1-by-11-inch strips. Next she paints the edges of the strips, carefully choosing the palette, mindful that her end goal is to create an optical illusion, suggesting many colors, though she uses only a handful of hues on the edges. Layering white strips of paper next to red and orange ones will create the illusion of peach, for example. When the paint is dry, she draws or writes “eshgh” on each strip of paper (which, corresponding to the ketab concept, she calls a “page”). Once she has a stockpile, she begins rolling the pages into a ketab. She chooses a knitting needle from the jars of dozens she stores in her studio, carefully wrapping the strips around the needle and strategically adding new pages for size and color. Most ketabs end up being 3 to 5 inches in diameter; they resemble rainbow hockey pucks. The finished rolls are then arranged in a custom-made gessoed frame. Arranging them is a bit like playing Tetris, but once she’s satisfied with the final composition – usually a circle or rectangle – she slathers the back of each ketab with bookbinding glue and waits for the finished tome to dry. Shafie’s family immigrated to the United States when she was 13. Her father had been an engineer but ended up opening a framing shop in the Washington, DC, suburbs. “That worked out well for me,” she jokes. At 47, she finds herself draw-ing more and more on her Persian heritage, and has been featured in exhibitions and articles focused on art from the Middle Eastern diaspora. 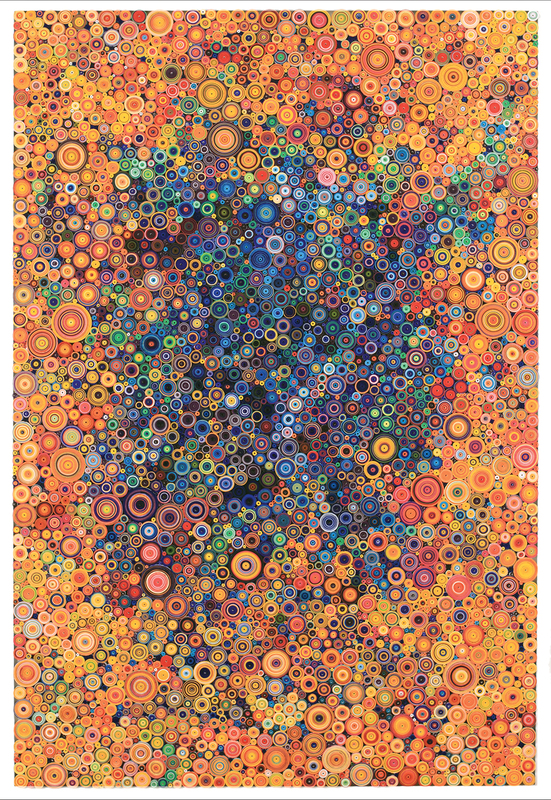 She’s preparing for a show in Dubai, has exhibited in Abu Dhabi, and was shortlisted in 2011 for a contemporary Islamic art prize awarded by London’s Victoria and Albert Museum. Instead, she looks to her culture for iconography. Secular Persian poetry inspires Shafie, not the Koran. And as she traces Farsi words each day, she continues to find deep meaning in making her own hand-rolled scrolls. Rebecca J. Ritzel is a freelance journalist in Alexandria, Virginia. Ghalb 8 (2015) is from a series inspired by Turkoman jewelry and an abstracted heart shape. 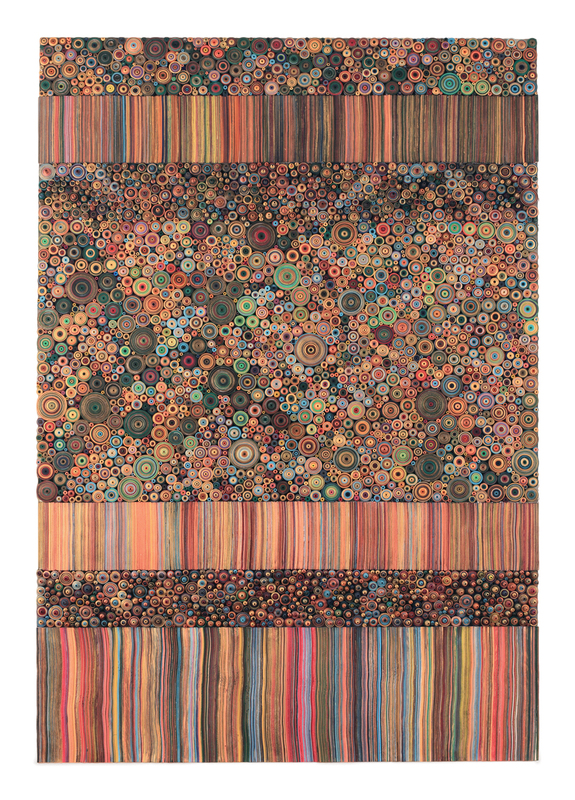 In the Klimt-like 10 Colors (2015), she played with the movement of color across a surface. 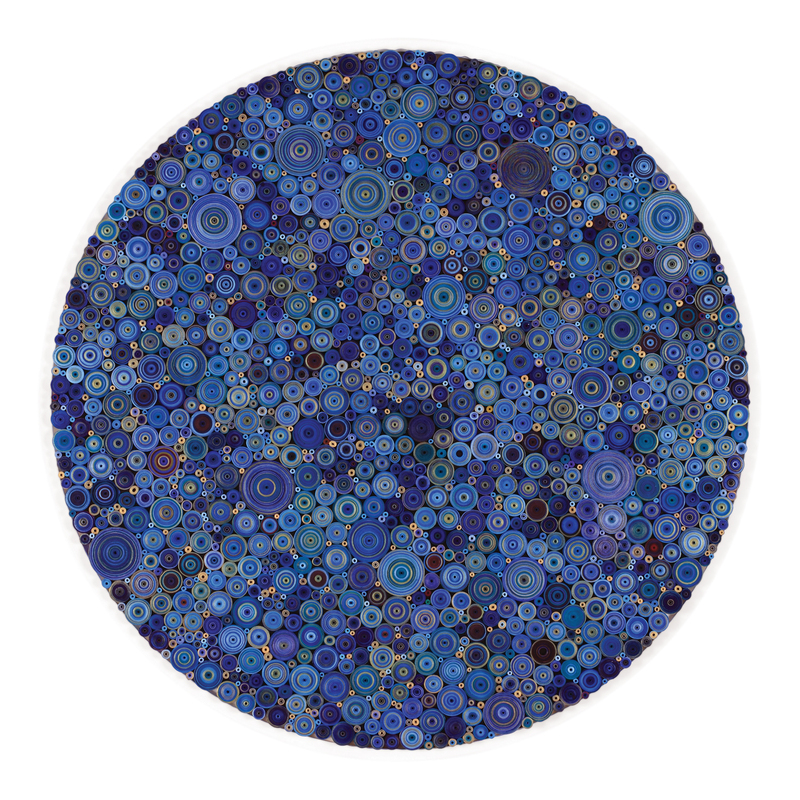 For Abi Abi (2013), which translates as “Blue Blue,” Shafie dipped ketabs of various color formations in two blue pigments. Shafie’s process is painstaking. Before she can make even one scroll, she has paper printed with the word eshgh and cut into strips. Then she paints the edges of the strips and draws the same word on them. Transition 5 (2016) presents text in three forms: ketabs (rolls), spikes, and “stripes” (unrolled strips). 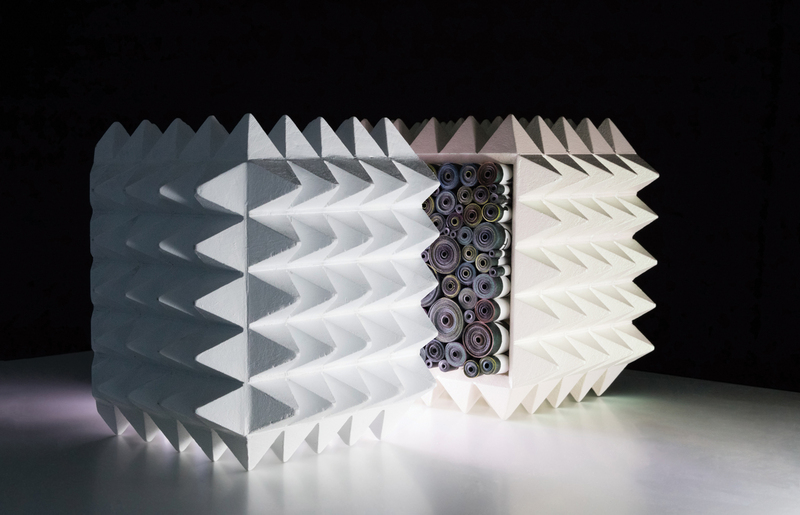 A detail of Transition 5 highlights the sculptural quality of Shafie’s spikes and rolls – and the dramatic shadows they cast. On the right side of Forugh 7 (2014), a poem appears twice: on the inside of closely stacked paper strips and across their edges. 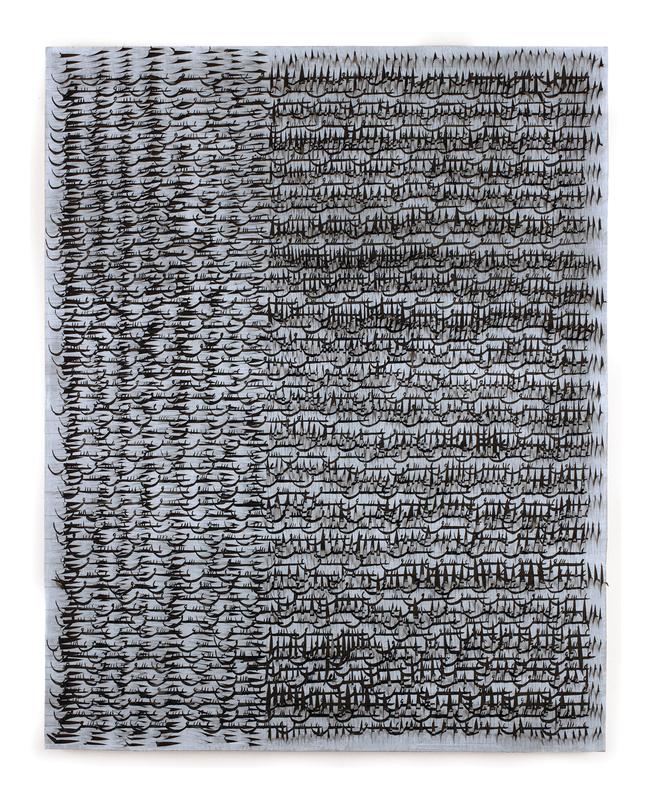 Shafie calls Spike 8 (2015) a “controlled unraveling.” The 7-inch spikes reveal the script coiled within the artist’s scrolls. For Grid/Cut 9 (2015), Shafie kept the paper tendrils left over from carving mat board to create a sense of depth and movement on the surface. This is a work in progress from Shafie’s Block series, which takes scrolls off the wall. She doesn’t know if the two parts will ultimately be paired.